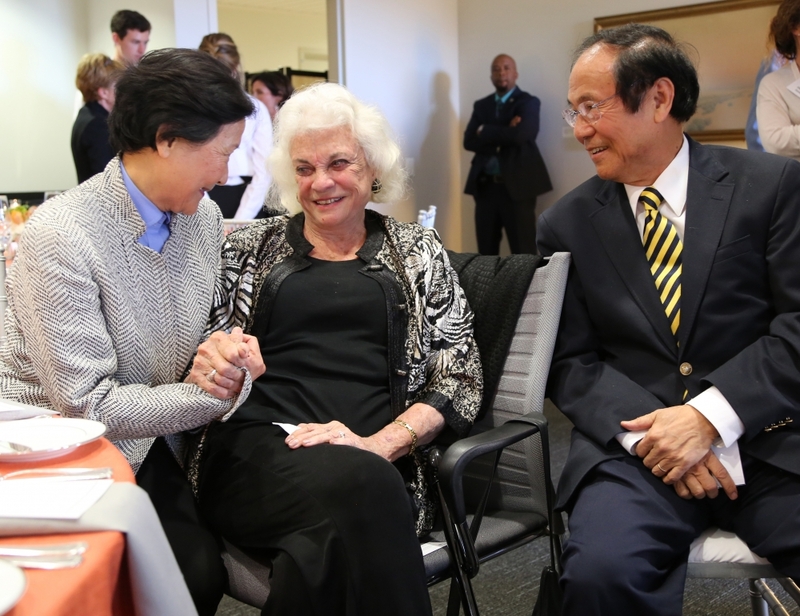 Sandra Day O'Connor (center) chats with Chancellor Henry T. Yang and his wife, Dilling, at a reception following the retired Supreme Court justice’s talk in Campbell Hall. The statistics are somewhat staggering. According to recent assessment tests, only 7 percent of eighth-graders nationwide can name the three branches of government. Only a third can name a single United States Supreme Court justice, and among high school seniors, less than one-fifth can explain how citizen participation benefits democracy. These numbers don’t bode well for the making of an informed citizenry, and Sandra Day O’Connor finds them more than a bit disconcerting. “Our society at present suffers from an alarming degree of public ignorance when it comes to the way our government is structured and how it works,” said the U.S. Supreme Court associate justice who retired from the bench in 2006. The first woman appointed to the Supreme Court, O’Connor served for 25 years. 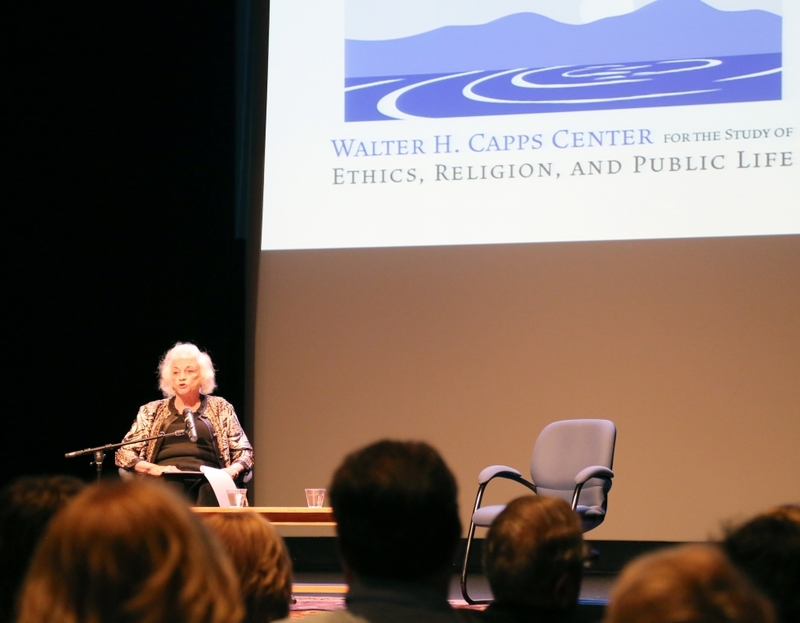 “Less than one-third of eighth-graders can identify the historical purpose of the Declaration of Independence,” she added, “and it’s right there in the title.” O’Connor spoke to a nearly packed house at UC Santa Barbara on Saturday, May 10. Her talk, “Educating for Democracy in the Digital Age,” took place in Campbell Hall. It was free and open to the public. A question-and-answer session followed, moderated by Clark Roof, the J.F. Rowny Professor of Religion and Society at UCSB and director of the campus’s Walter H. Capps Center for the Study of Ethics, Religion, and Public Life. The Capps Center sponsored O’Connor’s visit. Since her retirement, O’Connor has made it her mission to bring back civics education. Working with experts in law, education and technology, she helped create iCivics, a web-based education project that offers an array of free interactive games and activities for students. The games place students in different civic roles and give them an opportunity to address real-world problems and issues. Rooted in clear learning objectives and integrated with lesson plans and support material, iCivics enables students to gain foundational knowledge about democracy, how it works and how it can be used to solve actual challenges that they might face. The project has received the American Library Association’s award for the Best Websites for Teaching & Learning. The award recognizes websites that foster qualities of innovation and creativity, active participation and collaboration. According to O’Connor, 6 million students visited the site in 2011, and three years later more than 65,000 teachers are registered on iCivics. “For young students in elementary and junior high school, one of the best ways to educate them is by embracing the digital age. Technology can be used effectively to help students learn to be better citizens, and to engage in civil discourse,” she said. “Democracy is a sustained conversation among our citizens — how best to govern ourselves,” O’Connor continued. “But people can’t effectively participate in that discussion if they aren’t somewhat fluent in the topic.” The public school system has to prepare young people to become knowledgeable citizens to ensure that our democracy will progress and function as it should with vibrancy and intelligence, she said.